IN God we trust, everyone else is data,” says Sajith Sivanandan, managing director of Google Malaysia. In its new endeavour, Google has teamed up with UK-based market research firm TNS Global to produce the Consumer Barometer, an online tool providing insightful data on consumer Internet usage across 56 countries, including Malaysia. Available at www.consumerbarometer.com, the data includes insights on online video consumption, purchasing habits and multi-screen usage — information which is helpful to businesses, advertisers and just about anybody interested in understanding how people are using the Internet today. “We want to learn how people behave online because that has a lot of implications for businesses,” Sajith says. Some of the findings with regard to Malaysia are especially useful for businesses planning to gain considerable traction in the market. For starters, Malaysia is one of five countries in the world where smartphone usage is higher than computer usage. Others are: China, Hong Kong, South Korea and Singapore. According to Sajith, 35% of Malaysian users surveyed say they exclusively use their smartphones to access the Internet, making Malaysia the number one country in the world when it comes to smartphone Internet access exclusivity. It is a different situation in the West, where no countries have shown such a trend. “It’s not quite an achievement or anything but it’s an observation of behaviour that Malaysians love these portals and when they want to access the Internet, they like to do it almost exclusively through their smartphones. “To be the country with the highest percentage of exclusive use of accessing the Internet via smartphones is an interesting observation of Malaysian user behaviour and also an interesting guide to what the future looks like as more and more Malaysians get more and more smartphones,” explains Sajith. Some 41% of Malaysians research products and services on their smartphones before purchasing them. The statistics in Europe are much lower, with the UK at 21% and Germany at 20%. If it isn’t already clear enough, Sajith stresses that businesses in Malaysia should adopt a “mobile first” mentality in order to make a mark in consumers’ purchasing journey. This includes having a mobile application, a mobile-friendly website and a mobile purchasing portal, among others. He also states that no industry should be excluded from having a mobile presence. “Any business and anyone out there, your customer is already mobile first. So if you are not, you are basically wiping out your business yourself. It’s incredibly important to be online and if you are online, make sure you have a mobile presence. If you want to be in business — mobile first,” he says. 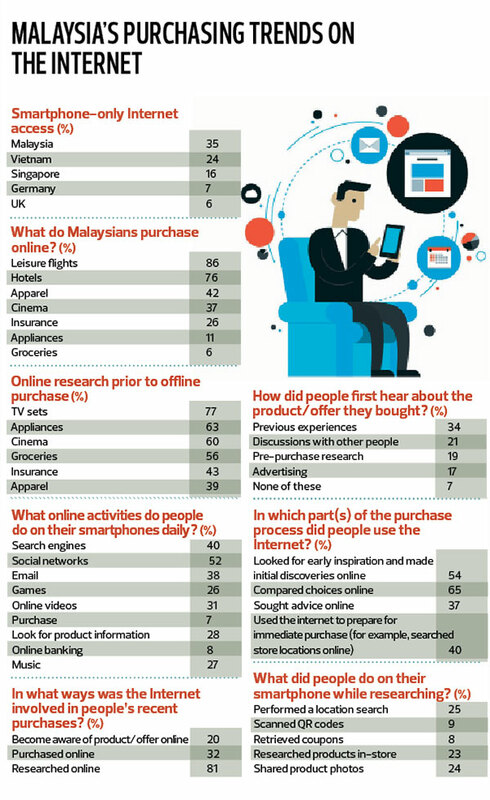 Malaysia stands out when it comes to the number of people who research online before making a purchase. According to data provided by the Consumer Barometer, 70% of Malaysian respondents research their last purchase both online and offline — one of the highest rates in Southeast Asia. This figure, however, does not translate directly to the frequency of online purchases by Malaysians. From the research, only 28% of Malaysians revealed they shopped online on any device. This compares with Japan at 72% and the UK at 78%. When asked about the gap in researching and purchasing activities online, Sajith reminds us instead to understand the nature of different industries and how it would play up in the online world. With the prevalence of Internet usage by Malaysians, the trend is only going to go up, he adds. Sajith comments that it is up to Malaysian businesses to satisfy that hunger, with all the innovation and creativity that’s out there. However, this is not to say that being solely online is good enough for businesses. It can serve as an essential tool in boosting offline sales and creating top-of-mind awareness among consumers. “One key thing to remember is that the behaviour of people is such that you need both online and offline validation. So if you are doing some research or anything, you aren’t just doing so online but you will call someone up and ask your friends, ‘Hey, did you hear about that?’” says Sajith. Data isn’t the be all and end all, but it certainly does give clues as to how businesses should move forward and thrive in their respective ecosystems. Businesses should scale up in terms of how they can serve customers online, making their presence prevalent and ubiquitous in the already cluttered online world, Sajith stresses. This article first appeared in #edGY, The Edge Malaysia Weekly, on November 3 - 9, 2014.